A cold October day in a goods yard in Dagenham might not seem like the most glamorous way to spend a day, but it made the perfect setting for a getaway movie. Containers littering the area suggest that the location could be anywhere industrial. 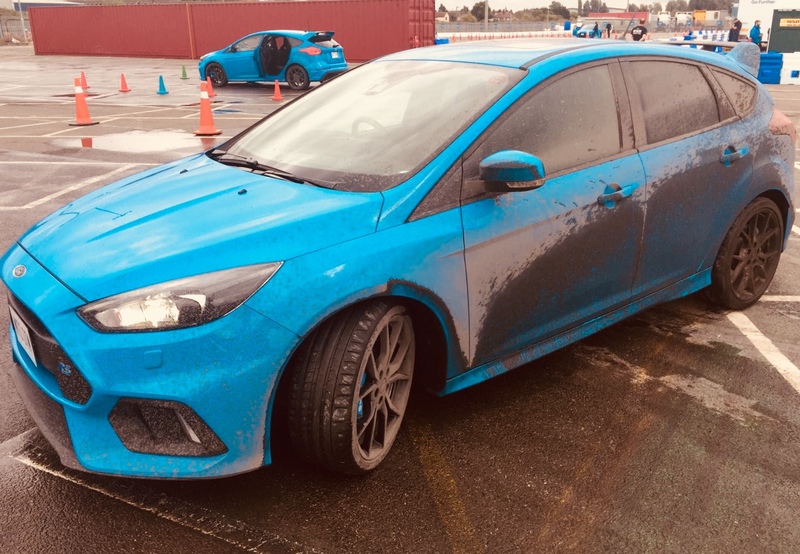 We’ve arrived for a day of stunt driving in Ford’s Focus RS and Mustang halo models, with a promise of being part of the action. 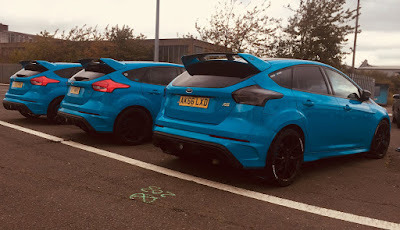 Pulling up through a set of security gates, we tuck our nose in to a space alongside a modified bright blue Focus RS, this thing has presence. The RS is less than subtle in standard guise but sat low with exhausts big enough to attract interest from a party of caving enthusiasts keen to wander in and explore; there is no doubt that this is a machine meant for more than family-hatch duties. The two other blue examples look considerably more reserved by comparison. It’s clear that the day is going to connect with enthusiasts – one of the keenest proudly grinning under his RS emblazoned baseball cap; but there’s a good mix of people and cars in the car park, a selection of hot machinery from Subaru to Golf R, Mustang to a GT40, and plenty of more ordinary metal too. Between two huge movie poster style banners, is a sign on a tent showing a trailer reel, ‘props’ from the movie and a machine dispensing welcoming hot cups of coffee. Producer Jess comes over and firmly grabs my hand “Michael, great to see you!” (We’ve never met before) “I’ve seen some of your work and your agent… well they say you’re the best in the business! Look forward to seeing you out there”. It’s a fully immersive experience this – think Secret Cinema and you’ll not be far off the mark. 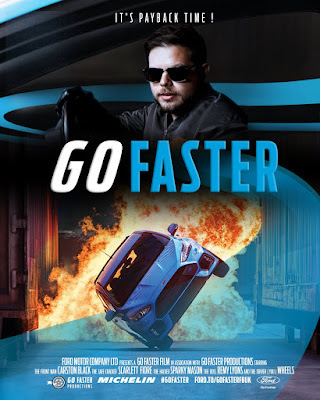 The basic premise is that a slick looking heist movie ‘Go Faster’ (itself a play on Ford’s current ‘Go Further’ tagline) is in the process of being shot. Most of the film has been cast, save for one key character the androgynous ‘Wheels’ as eponymous wheelman (or woman). Here’s where we come in, auditioning for the role. We’re given a tour of the ‘set’ complete with catering, edit suite, wardrobe and led through to a coned area where a team of stunt drivers arrive sideways, in a cloud of tyre smoke, drifting, donuting and braking hard to a stop just ahead of us, a line of 8 or so RS’ and a pair of Mustangs, offering a taste of what’s to come. ‘Henry’ a superbly over-the-top British ‘Stunt Supervisor’ gets us going. Calling names from his clipboard, he directs us off in groups of three to our various stunt lessons. First up, it’s the J turn; actually my favourite of the day. There’s a nervous energy made all the better by being one of three people taking turns behind the wheel of the car. ‘J Turn John’ gives me a nod “Right arm at 9 o’clock, spin it right, round to 6… Into first – away you go.” My turn. Jumping into the driver’s seat I eye up the rear-view mirror and my hand for some reason wanders to the handbrake. “You won’t be needing that!” I give it a go… up to 20, some fast steering, but too slow into first. 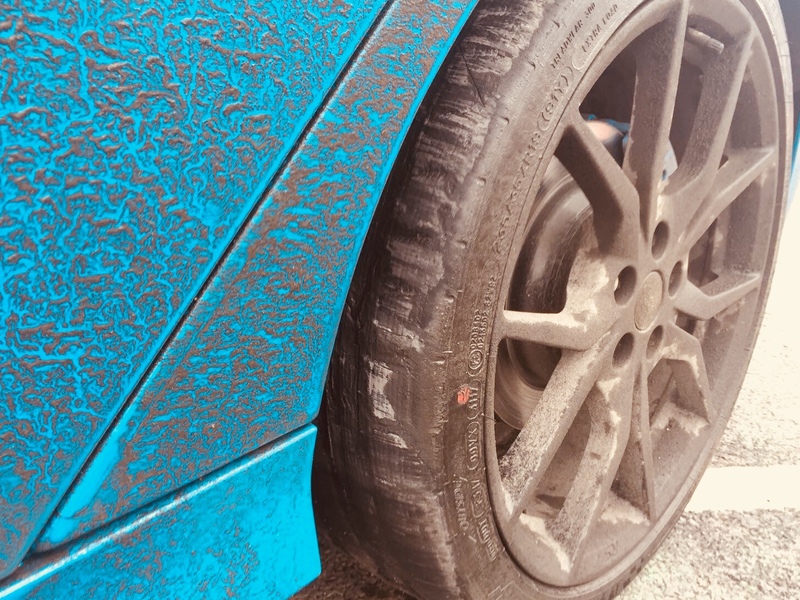 It’s ok though, there’s two more goes to perfect this… Second time, left hand on the gearknob ready; I focus, hard on the throttle – aggressive steering input and flat out with a satisfying squeal from the tortured tyres. I checked the trip computer – 83 miles old and an average of 2.7mpg. No question these poor cars have lead a hard life… The third time I hit it harder still, properly satisfying. Taking a seat in the back the manoeuvre feels absolutely savage and my head ricochets off of the inside of the c-pillar in a cascade of four letter words. None of us are being easy on the car. Poor thing. Next, is a handbrake park. This time the car’s been rigged with a hydraulic handbrake to help kick the back end round– it’s particularly tricky this, a tight box marked out with cones looks impossibly small. Our driver, one of Paul Swift’s team, tucks it in in an effortless manoeuvre that’s never going to be easy to replicate… Deep breath and away we go, the back swings round and I miss… the back end is sticking out. Round two with a bit more aggression and the front end nearly swallows a cone. Third attempt and it’s in; just, and not neatly either. Reverting to type I ask our young driver about his job – “Go on” I say… “What’s it like to do this for a living?” He grins at me “What do you think? […] I’m at college actually” he replies… “I do this part time”. I’m jealous – when I was his age the closest I got to professional driving was behind the wheel of a B&Q van in between hefting bags of concrete. We goad him into some hooliganism – holding on to anything we can use to keep ourselves upright – the RS pulls up to 1G sideways… It turns out he’d been stunt driving since the age of 14. For the next challenge it was time to swap RS abuse for Mustang time-trial action. Just one practice this time, slaloming through cones, a couple of roundabouts and stop in the box. Sounds easy, but it’s tight. 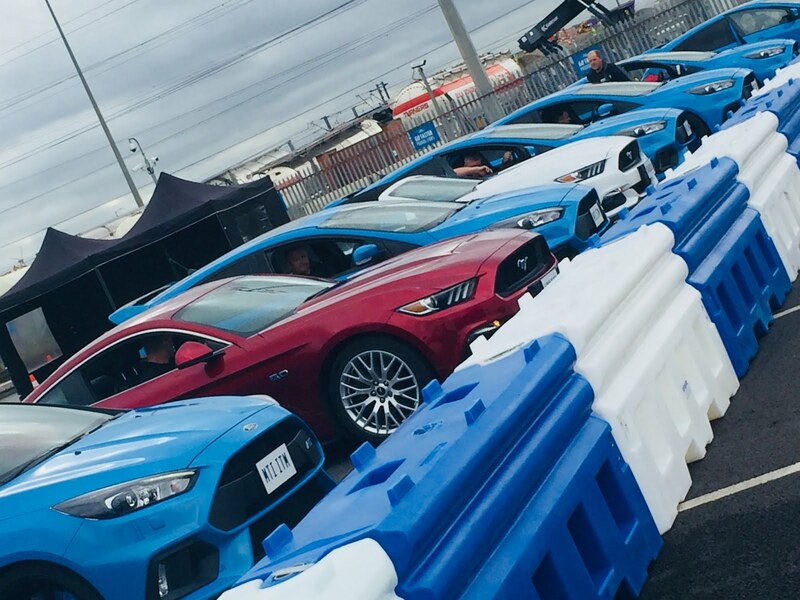 After the agility of the RS the Mustang feels like an absolute barge. Yes, it sounds the better of the pair, arguably it looks better too, but by comparison it feels soft and unwieldy; like pushing your couch through football agility training. The key here is smoothness not speed. Sadly, by this point my inner yob had already made a judgement call. I’m not going to be the fastest but I definitely want to be the most sideways. No time to wrestle with my Id, I decided to go committed. The donut is a mix of understeer, oversteer and smoke but if nothing else a big grin. Fast it was not – around the bottom of the top ten. On the road this is a superb GT, here it lacks finesse, I suspect the brilliant Fiesta ST would have taken several seconds off the time. Back to the RS then; this one feels more tortured, more tired than the others. The heating is on full blast, almost unbearably hot, an effort to direct heat away from the engine. The rear grab handles are missing too, ripped from the headlining. 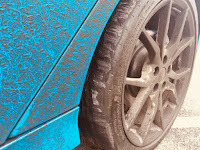 It’s filthy, with bits of tyres hanging off the wheel arches. It looks mean; angry at its mechanical torture. This is the drifting section and there was no sympathy. The Focus is in ‘Drift’ mode, ESC off. 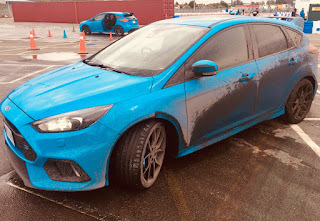 As I hurled left around a single cone in the centre of the deliberately wet box, the back end broke free and my poor passengers were thrown into the door cards, switching direction was absolutely savage, violently throwing everybody to the otherside of the car “that’s how the handles came out” laughed our instructor. With no air to cool the 2.3 turbocharged lump, engine temps climbed, eventually overheating the steering and rear diff causing the car to wash wide. We’d broken it… temporarily at least and a slow drive was needed to get some cool air back through the front. I needed it too. Dressed via the wardrobe in a green bomber jacket and leather gloves we made our way indoors for some green screen action. Posing for a photo and doing my best to wind down the cheese, I found myself in a rig ahead of a green screen, superimposed into a movie poster. Director Gus, a hilarious pastiche encouraged us through a short acting sequence that would be inserted into the film’s movie trailer (see below) – an awesome momento of the day. Of course, interior shots driving the car were also needed, bringing us on to the final challenge. We were met again by Henry, who gave us our final instructions – a series of manoeuvres, this time watched by all the participants and no practice, just one take. The Focus looked odd, the badges and plate backwards, setup so that it would work for the left hand drive cars of the America-set film. For the first time I felt nervous.. Nobody wants to fluff up a stunt in front of a crowd. J turn first; I floored it, yanked the steering, slipped the RS into first and floored it again. I pulled it off too, phew. A drift around a camera followed for a side in – shot and a powerslide with a glasses off – stare at the camera before heading back to the studio. It has been an epic day and I awaited the trailer eagerly – yes it’s a bit cheesy but I’m somehow quite proud of it. This was a day of genuine excitement, yobism and automotive abuse that you’d never in your right mind subject your own car to. Worth the £99 ticket price? Absolutely. I must have used that in tyres and fuel, let alone the wear to the cars. No, the cost of Go Faster is incidental; really, this is a masterstroke in marketing. A few cars, a superb setup and experienced stunt team all cost; but compared to say, pitching an SUV during Premiership half-time this is cheap advertising. In an age where social media rules, this is viral marketing at its best. It’s an experience you’re unlikely to forget and one you’ll probably keep talking about too. If this is how Ford want to sell us its cars, sign me up; I’ll happily pay for the privilege. Marketing is most definitely best when it’s done sideways.